Sonic Limeades are delicious and this recipe is even better! Try out this Mock Sonic Limeade, you’ll be so glad you did! First, I have to note. Having a blender is not a necessary contraption. I mean, there are all kinds of devices that can sort of do the same thing. The food processor, for example, could surely blend a drink. Right? Or, considering we can get crushed ice out of our fridge, a close second could be obtained using that. However, since our blender died a couple of days ago, nothing seems to make me feel like wanting to blend a drink more! Especially since I found this recipe and fell in love with it, right before the stupid thing decided to die. So, I suppose I will be getting online today, in search of replacing my blender. Joy of joys. We’ve only had that thing a year or so! Of course, Chief Zoo Keeper does use it almost literally every day…. Still…. 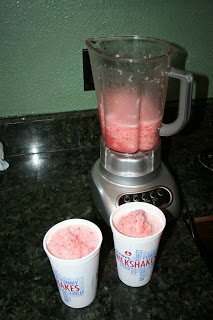 Fill blender with ice. Add other ingredients. Blend. I know, it’s rocket science but you can do it! What’s your favorite cool down drink on a hot summer day??? Don't Miss This: The Perfect Summer Potato Salad! ← Show Your Team Spirit with MasterPieces Giveaway! Oh yeah, these are a classic fav.? Now you have me craving Sonic!! This sounds so refreshing and delicious! Thanks so much for sharing at Mom On Timeout! Thank you so much for linking with “Wednesdays Adorned From Above Blog Hop”. These look really good. Hope you link again this Wednesday. Yummy! I seldom miss Sonics happy hour. I am now following you on linky and GFC. I would love for you to visit, follow back and maybe even link up on my linky party. Yum! Those are my favorite. Thanks for sharing. Newest GFC follower. Love for you to stop by and follow back when you get a chance. Look forward to reading your blog! So glad to find this. Our sonic closed and they loved their slushes!